Perched on a picturesque hill in the very center of Olesno, the Oleno hotel offers its guests comfortable accommodation and excellent conditions to organize various events, banquets and meetings. The Olesno hotel features modern rooms with air conditioning, satellite TV, mini bar, telephone, Internet connection, and private bathroom. There is a one room for the disabled. The hotel also offers two family apartments with one shared bathroom. Guests will dine in air conditioned restaurant with modern interior and smoking and non smoking sections. The restaurant serves traditional Polish dishes, international cuisine and vegetarian menu. Guests can spend leisure time in a cozy bar with a billiard table. The bar serves a wide range of alcoholic and nonalcoholic drinks. There is also a conference room. 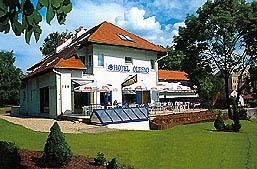 Olesno Hotel, 15 rooms with baths. USD is the base currency for conversion to PLN rates. PLN rates change with the fluctuations of the USD. How to get to Olesno Hotel, Olesno?